The Analects express a philosophy, or a moral code, by which the author, one of the most humane thinkers, believed everyone should live. Upholding the ideals of wisdom, self-knowledge, courage and love of one's fellow man, this title argues that the pursuit of virtue should be every individual's supreme goal. Start reading The Analects: By Confucius - Illustrated on your Kindle in under a minute. Analects, in case you were wondering, are "selected passages from the writings of an author.” I mention this definition here because it seems that the only time we use the term “analects” is when we consider the writings of Confucius. Was there once a larger corpus of writings from Confucius, and is what we have today distilled from some larger body of work? If so, then I wish we had that entire larger body of philosophical work, the same way we have a good many books from classical Greek philosophers like Plato and Aristotle; but that being said, I certainly am glad that we have the Analects as a distillation of Confucius’ philosophy. His Chinese name was K’ung Fu-tzu, 孔夫子, and the Latinate name that he bears today was probably bestowed by Jesuit missionaries to China in the 16th century. By any name, however, Confucius is a great philosopher who speaks to us today just as clearly as he spoke to the people of Chinese antiquity. He lived a long time ago – when he died in 479 B.C., the Spartan defense of Thermopylae had taken place just one year before – but it is astonishing how current and relevant his words and ideas remain. “Analects” is, of course, a Latin- and Greek-derived term; in Chinese, the book is 論語,the "Lun Yü." It is divided into 20 books, and contains a total of 512 Confucian sayings, most of them quite short. On this re-reading of "The Analects," I encountered some sayings that were already familiar to me: e.g., “To say you know when you know, and to say you do not when you do not, that is knowledge” (II.17, p. 65). Yet on this reading, I learned many things that I found new. Perhaps because I’ve been reading a good deal of classical Greek philosophy lately, I found some striking parallels between Confucius and the Greeks who wrote sometime after him. For instance, when “The Master said, ‘Barbarian tribes with their rulers are inferior to Chinese states without them’” (III.5, p. 67), it made me think of how the ancient Greeks considered any non-Greek-speaking society to be βάρβαροι, barbaroi, barbarians. I found myself thinking of the doomed tragic heroes of ancient Greek drama, men and women brought down by their tragic flaws, when I heard Confucius reflect that “In his errors a man is true to type. Observe the errors and you will know the man” (IV.7, p. 73). Additionally, in an acutely status-conscious society, Confucius’ listeners are very interested in what will help them achieve the distinction of “gentleman.” With considerable focus on the value of benevolence, Confucius suggests that “The gentleman understands what is moral. The small man understands what is profitable” (IV.16, p. 74). And in one of my favorite passages from the Analects, Confucius remarks that “the gentleman hates to dwell downstream for it is there that all that is sordid in the Empire finds its way” (XIX.20, p. 155). Readers who are interested in the Judeo-Christian philosophical and moral tradition may be struck by the ways in which Confucius disagrees with one of the primary moral imperatives of Christianity. In contrast with Lao Tzu, who in the "Tao Te Ching" tells his disciples to “do good to him who has done you an injury”, Confucius says, “What, then, do you repay a good turn with? You repay an injury with straightness, but you repay a good turn with a good turn” (XIV.34, p. 129). In other words, the only thing you owe to someone who has wronged you is straightness, directness, honesty. For Western readers, many of whom have been raised in the tradition of “whosoever shall smite thee on thy right cheek, turn to him the other also” (Matthew 5:39), this may be the most challenging passage in the entire "Analects." At the same time, Confucianism invokes the Golden Rule in a way similar to all the other great moral, philosophical, and religious systems of the world. In response to a disciple’s asking, “Is there a single word which can be a guide to conduct throughout one’s life?”, Confucius replies, “Do not impose on others what you yourself do not desire” (XV.24, p. 135). Perhaps because it is the dawn of a presidential election year here in the United States of America, I found that I was particularly interested in one particular example of Confucius’ advice to his disciples: “Be sure to go carefully into the case of the man who is disliked by the multitude. Be sure to go carefully into the case of the man who is liked by the multitude” (XV.28, p. 136). Good advice in the state of Lu during the Zhou dynasty, and good advice in any modern nation nowadays. I had this edition of "The Analects" with me when my wife and I were traveling in Beijing, home of the second largest Confucian temple in the world. Walking in the Forbidden City, my copy of "The Analects" in my jacket pocket, I wondered how many readers, imperial or otherwise, referred to their own copy of this book while traveling between and among the buildings of this most impressive city-within-a-city. This edition of "The Analects" includes a glossary of names and places mentioned in the book, an appendix on events in the life of Confucius, a textual history of the book, and a chronology of Confucius’ life. Particularly helpful is another appendix, one that describes the characters of the different disciples with whom Confucius speaks in the Analects. For readers of Confucius’ time, and indeed for followers of Confucianism nowadays, the differences in character among disciples like Tzu-kung, Tzu-lu, and Yen Yüan would be as self-evident as the differences in personality that Christians see among Saint Peter, Saint John, and Saint Thomas in the New Testament. 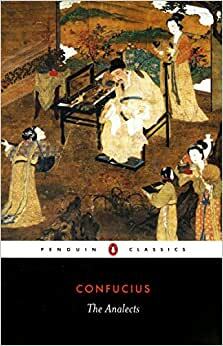 This Penguin Books edition of Confucius’ "Analects" is a very fine way to acquaint, or reacquaint, oneself with one of the most important books ever written. I own the Oxford World's Classics edition translated by Raymond Dawson. This was my first reading of 'The Analects' and while it was not quite what I expected, as it does not contain a truly coherent philosophy or even a consistent mode of presentation or authorship, it was nevertheless an incredibly rewarding study. And I say study rather than read because while it is quite brief (82 pages) there are a wealth of "chapters" that will leave you pondering--in a good way! If you are worried about the stereotype of vaguess and aloofness in Chinese sages, you needn't fear 'The Analects'. The main thing that can obscure some of the "chapters" is their reliance on Chinese history and most of these are briefly cleared up in Dawon's notes. 'The Analects' can be picked up and put down at a whim due to the informal structure and you will never feel that you lost the flow of it should a few days pass between readings. While I can't compare it to another translation or the Chinese, I found Dawson's translation to be very smooth and highly consistent throughout, and he supplements the introduction with helpful notes on his translation of key terms. This is an edition primarily for the newcomer rather than the scholar (not to say it is in anyway "dumbed down") as it is wonderfully concise in its introduction and notes, never saying more than needs to be said. However, in my case, I certainly wouldn't have minded more scholarship and context. Dawson uses Pinyin rather than Wade-Giles, which is a welcome shift in my eyes, as Wade-Giles often feels overwrought even if it sometimes comes closer to the true pronunciation, and there is a nifty conversion chart included in this edition. This edition like all of the newer Oxford World's Classics is neatly designed with a beautiful cover and good quality paper. Confucius - The Analects is a rather intriguing book since it aims to tackle information regarding the well known Confucius in a cogent manner. The book is laid out in a fairly straight forward approach with no frills that's an extremely quick read. Within the introductory section, there is some background material featured, while a tad later on the book features notes on particular translations that the book offers. Knowing how complex translations can be, it's a well-thought out approach to delineate what the book means by each translated term, instead of assuming that the reader will know. Not only that, but also, certain words have various meanings, so to be able to narrow down with precision what was stated is greatly appreciated. The totality of the book is seamlessly interwoven to give you everything you need for comprehension, while not an iota more. This certainly helps since other books can be longwinded at times.